Tried my hardest to find some wild boar for you today folks, but the weather was against me and I failed. Looking at it positively, a failure is one step closer to success, so it won't be long. 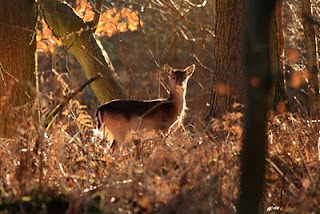 I did manage to spot a fallow doe before the skies turned grey and the sleet started to fall! I could see her grazing through some trees, she had the sun on her back. Carefully and quietly I crept up as close as I could, until I was no more than 7 or 8 metres away. There was a lot of bracken in the way and I was finding it hard to get a clear view. Then she spotted me! As long as you are quiet and calm, fallow deer will stand and look at you for a while before running away, this is when you can get your shot. Standing or sitting down, is the best way to watch any animal or bird. I was lying down for a while out there today Bob. Very wet and slippy. Saw you at New Fancy just after I got this shot.